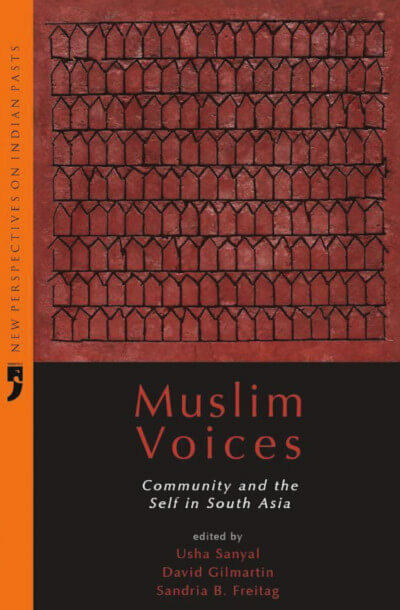 Muslim Voices brings together original scholarship that examines the changing contexts, concepts of community, and notions of the self shaping South Asian Muslims — some 40 percent of Muslims in the contemporary world — in the nineteenth and twentieth centuries. Muslim Voices brings together original scholarship that examines the changing contexts, concepts of community, and notions of the self shaping South Asian Muslims — some 40 percent of Muslims in the contemporary world — in the nineteenth and twentieth centuries. The essays in this volume recognize that identities are constantly being negotiated in changing historical circumstances, a negotiation which involves addressing tensions and conflicts around issues of authority, gender, social justice, and public versus private space. They further our understanding of the worldviews of specific Muslim “voices” and by placing them in their context, they also illustrate processes of change, contestation, and ultimately of political engagement. Sandria B. Freitag has long explored a range of source materials that can be used to answer new questions about non-elites in British Indian society (working on riots as windows into communal identity-formation; constructions of criminality; and visual culture for its revelations about popular values and motivations at work in public sphere activities). Publications include Community and Collective Action: Public Arenas and the Emergence of Communalism in North India (1989) and the collection of essays, Culture and Power in Banaras (1989), as well as numerous essays on crime and on the emergence of photography and poster art as the first two “mass media” produced in British India. These include, for instance, “South Asian Ways of Seeing: Muslim Ways of Knowing: The Indian Muslim Niche Market in Posters” in Indian Economic and Social History Review (2007); and “More Than Meets the (Hindu) Eye: The Public Sphere as a Space for Alternative Visions,” in Picturing the Nation (2007). She teaches visual culture and modern South Asian history in the History Department of North Carolina State University. David Gilmartin is Professor of History at North Carolina State University. He is the author of Civilization and Modernity: Narrating the Creation of Pakistan (2013) and Empire and Islam: Punjab and the Making of Pakistan (1988), and co-editor with Bruce Lawrence of Beyond Turk and Hindu: Rethinking Religious Identities in Islamicate South Asia (2000). He is currently finishing a book on the politics of water and irrigation in colonial India and researching the history of the law of elections in 20th- century India. Usha Sanyal is an independent scholar affiliated with Queens University of Charlotte in Charlotte, North Carolina. She is the author of Devotional Islam and Politics in British India: Ahmad Riza Khan Barelwi and His Movement, 1870–1920 (1996; new edition, 2010), soon to be published in Urdu, and Ahmad Riza Khan Barelwi: In the Path of the Prophet (2005). She is presently working on a comparative study of religious education among Barelwi women and Al-Huda International online female students of the Quran.